Many Vietnam veterans look back in anger on their wartime experiences, but Fixler, who endured one of the bloodiest battles of the war, isn’t one of them. The gruesome 77 days he spent defending an isolated hilltop near the border with North Vietnam forms the core of this nostalgic memoir. Growing up in a predominately middle-class Jewish neighborhood, Fixler was dazzled by his father’s stories of WWII and volunteered for Vietnam to earn his respect. As a teen, Fixler got into his fair share of trouble and that cockiness seeps into these pages. Arrival at the Marine Corps’ Parris Island boot camp is compared to “being thrown into a Nazi concentration camp.” He celebrates his sexual escapades and never sugarcoats the nasty business of war; he’d do “everything again in heartbeat.” Yet as wistful as he is about the “discipline” and “camaraderie” of the Corps, he’s unrelenting in his scorn for the soldiers who return in psychological pieces, suggesting that soldiers should just get used to killing. Nowhere near the league of We Were Soldiers Once…and Young, Fixler is nonetheless an intriguing, rare bird: a man who survived “hell in the raw” without a trace of trauma-or remorse. 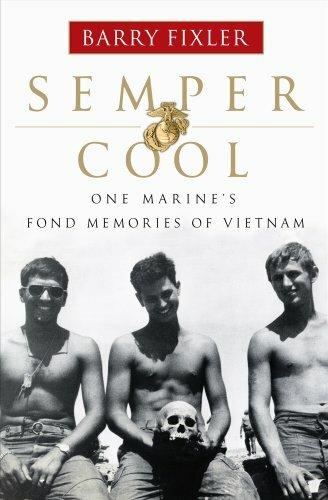 Semper Cool is an interesting book. You don’t expect to find veterans talking about Viet Nam as if it was a long, black comedy bit, and yet at times Fixler seems to do just that. Don’t get me wrong – this book is eminently readable. Fixler’s voice is alternately self-deprecating and wise-cracking. He doesn’t shy away from visceral description, and his scene-painting is very vivid. It’s just jarring to read something where someone comes home from a tour of Viet Nam seemingly unaffected. And maybe the fault lies with me – maybe I have come to expect jarring horror stories about this period so much that when I read a story that doesn’t dwell on the horror my brain can’t accept it. Bottom line: If you’re reading this for an unbiased look at Viet Nam, don’t. If you’re reading it for an entertaining look at one man’s experience, and how he personally grew after an experience that broke others, you’ll be satisfied, as I was, once I stepped away from the book, and stepped back with a fresh perspective.